Down a windy road, a cute little town and through the woods, you'll find Gillette Castle. And a lot of people find this castle. 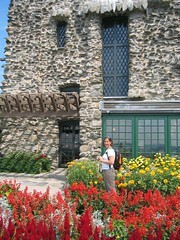 The castle was the brainchild and home of William Gillette, an actor best known for his portrayal of Sherlock Homes. The castle has the medieval look and all the oddities that one would expect of a creative genius. The tour is partially guided, but allows guests to wander through unusual rooms and explore some of the hidden gems of the home. This would include the trick bar that Gillette installed to watch guests fruitlessly try to avail themselves of his ample bar, while he watched from the second floor with a view afforded by some strategically placed mirrors. Everything in the place is unusual from the door handles, to the floors to the furnishings. Gillette has left behind a legacy of his creative genius that would be a shame to miss on a jaunt through Connecticut.